We minister to adults by promoting gospel change in men and women of every age. 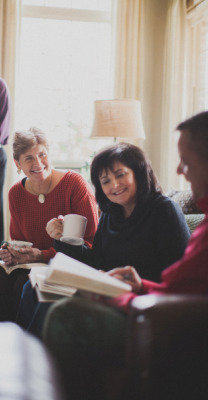 Our desire is to encourage and equip adult believers to thrive within our church community; to grow in grace and the knowledge of Jesus Christ through worship, study of God’s word both personally and with others, and to develop a healthy and maturing faith that is characterized by devotion to God and love for one another. We encourage all of our adults to find a group in which they can study the Bible with other Christians. Most of our adult Bible study classes meet on Sunday mornings at 9:00. Weekday classes are available for ladies. Community groups meet periodically on weeknights. Click here for a list of Sunday morning Bible study groups. Part of our growth in grace depends on the outward act of serving others. All of our church family is encouraged to find a place to serve within the church body and out into the community beyond the church. Here are some ways that you can serve. Connection with others fosters trust and nurtures faith. Here are a few of the many groups that seek to promote faith and community through fellowship. Senior Adults gather for a fellowship luncheon every month. Many of our seniors are role models for our younger church members as they serve others within the church and throughout the community. Monthly gatherings help them stay connected to the local body, offering opportunity for fellowship and encouragement. Single Adults gather weekly for Bible study on Sunday mornings and pursue other oppportunities to fellowship, all the while encouraging one another to faithful service. Click here for a calendar of activities. Men's prayer breakfast is held every month to strengthen relationships between younger and older men. The Family Life Center offers a variety of activities for people of all ages. Fitness, exercise classes and other opportunities for connecting with others are available. Contact info@csbc.us for more information.